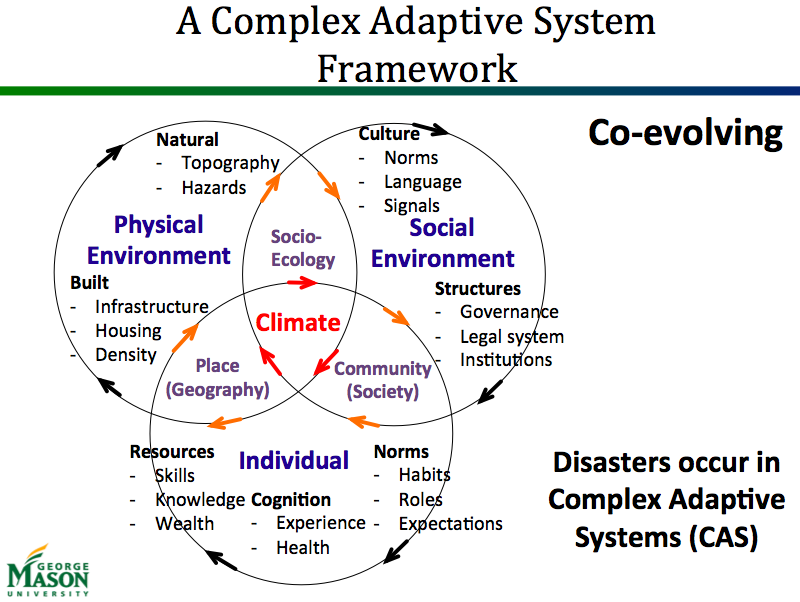 In my last blog I wrote how the study of disasters needs to account for three interacting complex adaptive systems, the physical environment, the social environment and the individual cognitive environment. Agent-based experimental simulations of populations responding to disasters need their synthetic populations to represent not just the individual characteristics of people, but also the social connections that influence their behavior. Tomorrow I will present a paper on how to generate such a population at the Computational Social Science Society of the Americas in Santa Fe, New Mexico. 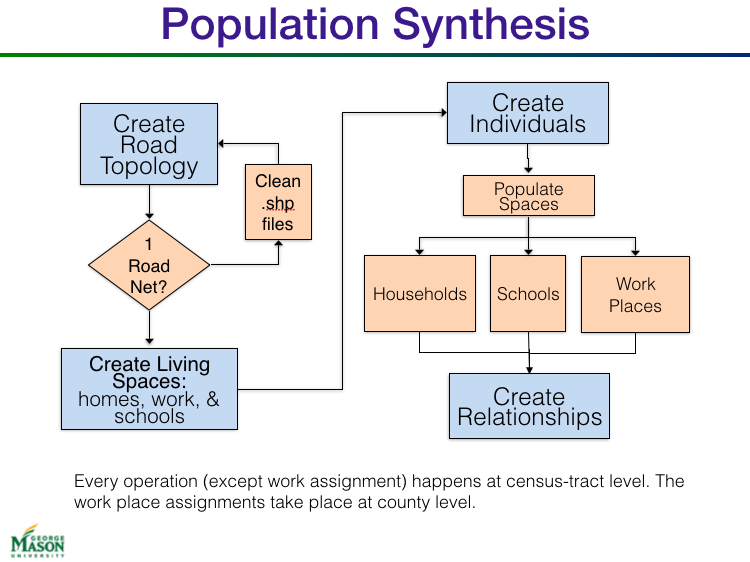 The paper, co-authored with my fellow researchers at George Mason University, discusses how a mixed method of iterative proportional fitting and network generation to build a synthesized subset population of the New York megacity and region. Our approach demonstrates that a robust population and social network relevant to specific human behavior can be synthesized for agent-based models. 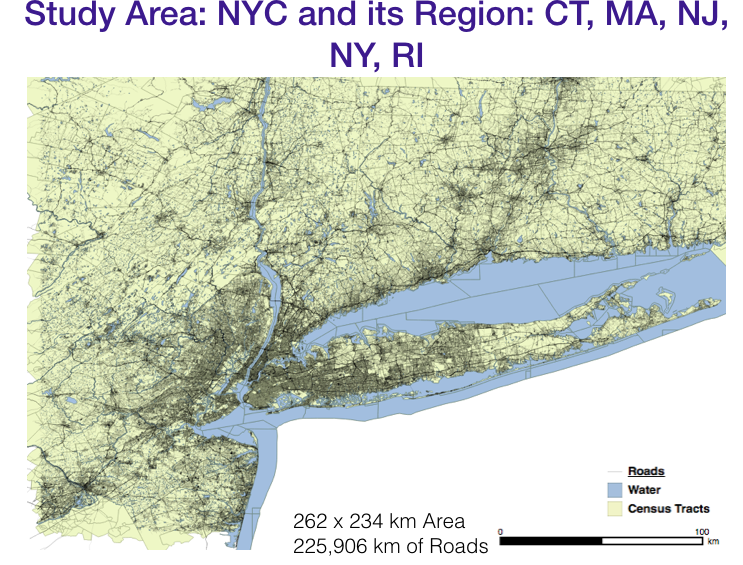 The study area includes New York City and the larger megacity region. 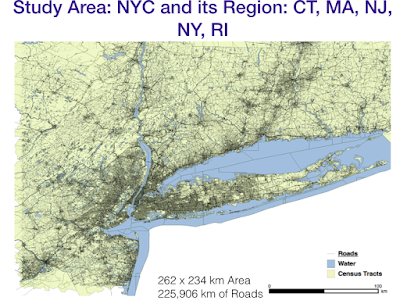 The New York Megacity and region includes very dense areas and rural ones. We are creating a 1:1 population based on the US 2010 Census, and we use Iterative Proportional Fitting (IPF) for the population synthesis. This is a method in which the attributes of an individual unit are taken from a data set with fixed marginal totals. For each agent in the model a random sample is taken from a probability distribution of the relevant attributes existing in the population data. This process is repeated until all the attributes are assigned to the agent population. In the last stage of the process we create social networks based on family, work and school connections. 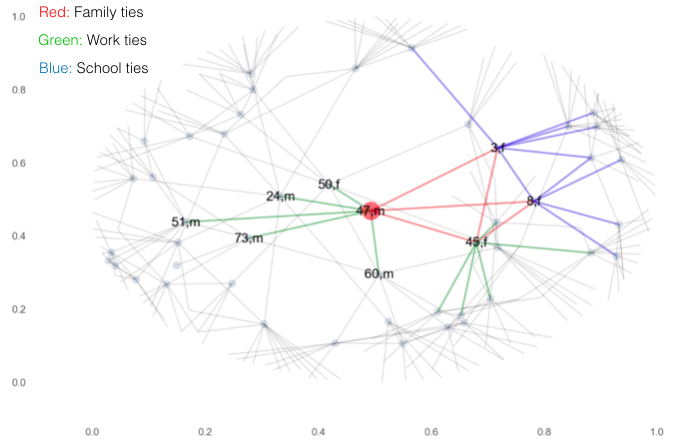 If a network tie in larger workplace and school populations, we created a small-world network from the potential pool of network connections. 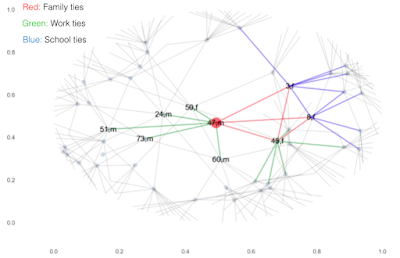 The result are thousands of network connections that extend individual and family social ties beyond their households. This shows a family with two working parents and their two children. What are frameworks for understanding disasters? 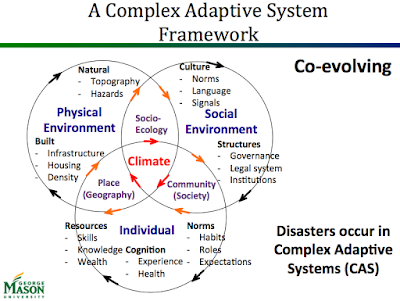 And, how can a Complex Adaptive Systems framework provide better understanding?